Tales of the Trees: Our fun new VeggieTales toy! Just the other day Luke and I were talking about television and all the options that kids have nowdays. I know that makes me sound ancient but think about it, when we were kids we had one maybe two channels devoted to kids. Now kids not only have a plethora of channels to choose from on TV but with the click of a button, or rather swipe of their finger they can use various tablets and phones to watch a number of shows. As a parent this can be a bit unnerving. While it can be nice at times to let your child have some rest time with a TV show, you also have to be on your toe,s careful of what they are watching. There are definitely some shows that aren't something we would want Eli watching even though they seem geared towards children. However one show Eli loves that we are completely ok with is VeggieTales. This is a show that promotes strong values and lessons of faith in every episode. Eli began watching it at church and then we got some DVD's to watch at home and then found that there are lots of episodes on Netflix that he likes to watch. Eli loves watching VeggieTales, laughing out loud and singing along with the fun shows. We have even been able to incorporate several lessons from the show into our family life. Their Christmas special was wonderfully done and helped teach about giving and not just receiving which we later used in conversation with Eli while discussing the true meaning of Christmas. We are big VeggieTales fans in this house! I was excited when I found out that VeggieTales was releasing a line of toys geared towards children who watch the show. Eli and I went to Wal-Mart this weekend and I let him pick out a toy to purchase. He was SO excited and picked the Larry that sings the theme to the show. It also shakes around which he thought Anniston would love, and sure enough she loves to hold the toy while it sings to her and shakes all around. It's nice to have this toy in our house as a reminder of this positive show that we all love. 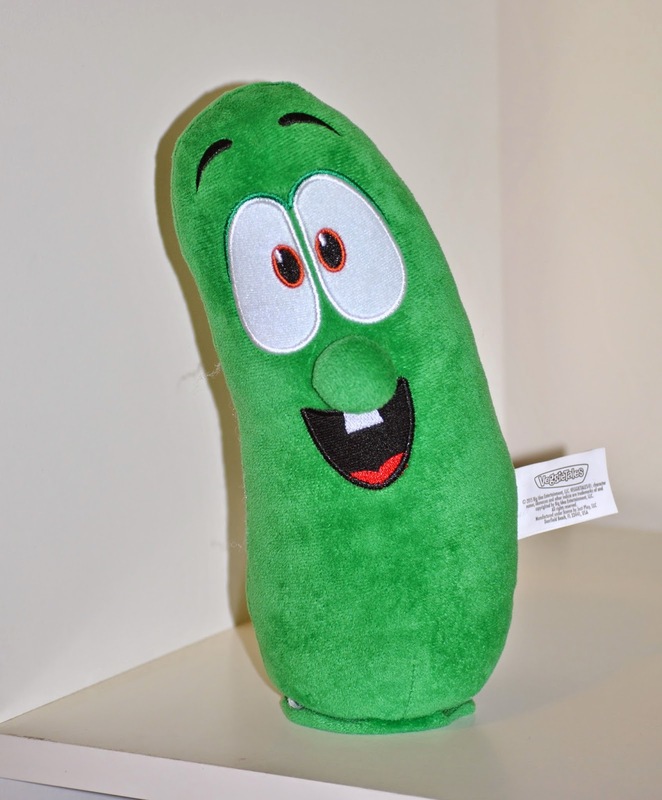 We watch VeggieTales in my classroom at church and I have plans to purchase this toy for the kids to play with in there. I know they will love it. Both kids have been playing with Larry and having fun together with the toy. How nice that it's a toy that both my kids, 3 years apart can enjoy together! I love it because Eli already loves the show so he sings along to the song, while at just a year old Annie has not yet been introduced to the show so the toy is completely new to her but when she watches the show it will already be familiar to her! 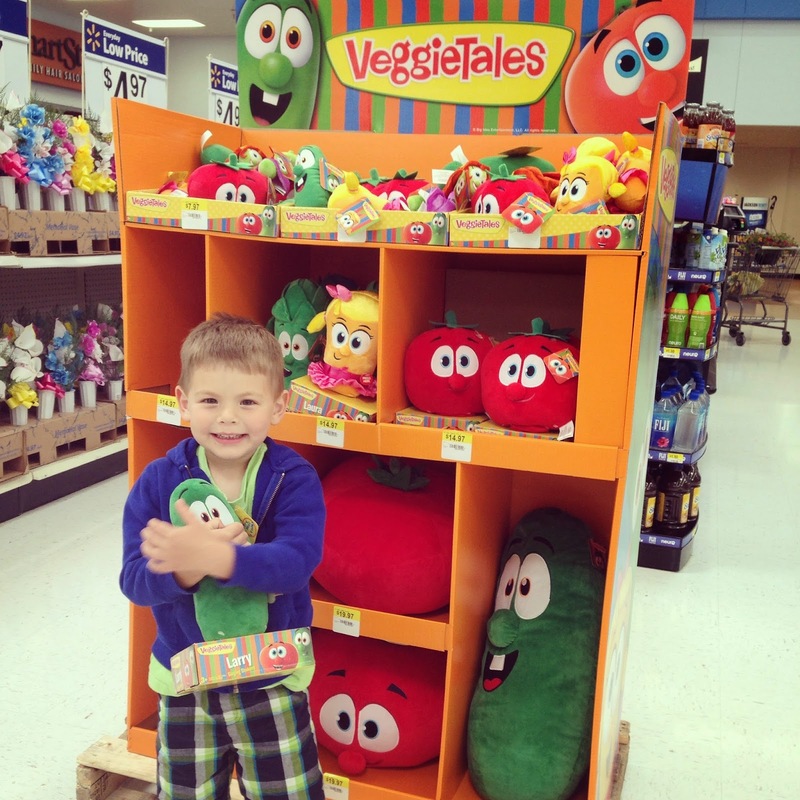 If you have a child who loves VeggieTales I definitely suggest you go to Wal-Mart and treat them to one of these fun toys. There are several options in various price ranges, perfect for just about anybody!